Dennis Hale, sole survivor of the Daniel J. Morrell disaster, was Keynote Speaker at the Great Lakes Shipwreck Historical Society’s annual Edmund Fitzgerald Memorial Ceremony. Dennis, now a very popular professional author and lecturer about his experience on Lake Huron in November of 1966, has developed a way of bringing crowds to understand the emotional significance of shipwreck with him, unparalleled by other speakers. He travels extensively throughout the country, telling his story, and his thrilling presentation at the Shipwreck Museum on November 10 was one of his best. 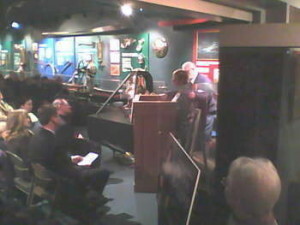 He invited audience members to participate; the first individual to get up and offer her own reflections was Cheryl Rozman, who lost her father on the Fitzgerald. The audience was greatly moved by the power of these presentations. The Shipwreck Society thanks Mike Fornes and the Whispers of the North band; Rev. Francis J. Ricca; the Newman Navy League of Sault Ste. Marie, Ontario; U.S. Coast Guard Sector Sault Ste. Marie, in particular Chief Marvin Lalone; Society Vice-President Bill McLeod; Operations Manager Bruce Lynn; and our many staff who worked so hard to make this event a success. Please click directly below to see a brand-new video created by Society Board Member Corey Adkins of TV 9 and 10 News to remember the Fitz in 2011.